This article is about the sedimentary rock. For the city in Michigan, see Flint, Michigan. For other uses, see Flint (disambiguation). Pebble beach made up of flint nodules eroded out of the nearby chalk cliffs, Cape Arkona, Rügen, northeast Germany. Detail of flint used in a building in Wiltshire, southwest England. Flint is very durable and can be found along streams and beaches. Its use to make stone tools dates back millions of years. Due to some properties of flint it breaks into sharp edged pieces making it useful for knife blades and other sharp tools. 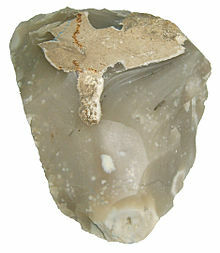 During the Stone Age access to flint was so important for survival that people would travel or trade to obtain flint. Flint Ridge in eastern Ohio was an important source of flint and Native Americans extracted the flint from hundreds of quarries along the ridge. This "Ohio Flint" was traded across the eastern United States and has been found as far west as the Rocky Mountains and south around the Gulf of Mexico. The exact mode of formation of flint is not yet clear, but it is thought that it occurs as a result of chemical changes in compressed sedimentary rock formations, during the process of diagenesis. One hypothesis is that a gelatinous material fills cavities in the sediment, such as holes bored by crustaceans or molluscs and that this becomes silicified. This hypothesis certainly explains the complex shapes of flint nodules that are found. The source of dissolved silica in the porous media could be the spicules of silicious sponges. Certain types of flint, such as that from the south coast of England, contain trapped fossilised marine flora. Pieces of coral and vegetation have been found preserved like amber inside the flint. Thin slices of the stone often reveal this effect. Puzzling giant flint formations known as paramoudra and flint circles are found around Europe but especially in Norfolk, England on the beaches at Beeston Bump and West Runton. Flint sometimes occurs in large flint fields in Jurassic or Cretaceous beds, for example, in Europe. The "Ohio flint" is the official gemstone of Ohio state. It is formed from limey debris that was deposited at the bottom of inland Paleozoic seas hundreds of millions of years ago that hardened into limestone and later became infused with silica. The flint from Flint Ridge is found in many hues like red, green, pink, blue, white and gray, with the color variations caused by minute impurities of iron compounds. Flint was used in the manufacture of tools during the Stone Age as it splits into thin, sharp splinters called flakes or blades (depending on the shape) when struck by another hard object (such as a hammerstone made of another material). This process is referred to as knapping. The process of making tools this way is called "flintknapping". In Europe, some of the best toolmaking flint has come from Belgium (Obourg, flint mines of Spiennes), the coastal chalks of the English Channel, the Paris Basin, Thy in Jutland (flint mine at Hov), the Sennonian deposits of Rügen, Grimes Graves in England, the Upper Cretaceous chalk formation of Dobruja and the lower Danube (Balkan flint), the Cenomanian chalky marl formation of the Moldavian Plateau (Miorcani flint) and the Jurassic deposits of the Kraków area and Krzemionki in Poland, as well as of the Lägern (silex) in the Jura Mountains of Switzerland. Flint mining is attested since the Palaeolithic, but became more common since the Neolithic (Michelsberg culture, Funnelbeaker culture). In 1938, a project of the Ohio Historical Society, under the leadership of H. Holmes Ellis began to study the flintknapping "methods and techniques" of Native Americans. Like past studies, this work involved experimenting with actual flintknapping techniques by creation of stone tools through the use of techniques like direct freehand percussion, freehand pressure and pressure using a rest. Other scholars who have conducted similar experiments and studies include William Henry Holmes, Alonzo W. Pond, Sir Francis H. S. Knowles and Don Crabtree. When struck against steel, a flint edge produces sparks. The hard flint edge shaves off a particle of the steel that exposes iron, which reacts with oxygen from the atmosphere and can ignite the proper tinder. Prior to the wide availability of steel, rocks of pyrite (FeS2) would be used along with the flint, in a similar (but more time-consuming) way. These methods are popular in woodcraft, bushcraft, and amongst people practising traditional fire-starting skills. 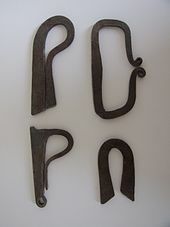 A later, major use of flint and steel was in the flintlock mechanism, used primarily in flintlock firearms, but also used on dedicated fire-starting tools. A piece of flint held in the jaws of a spring-loaded hammer, when released by a trigger, strikes a hinged piece of steel ("frizzen") at an angle, creating a shower of sparks and exposing a charge of priming powder. The sparks ignite the priming powder and that flame, in turn, ignites the main charge, propelling the ball, bullet, or shot through the barrel. While the military use of the flintlock declined after the adoption of the percussion cap from the 1840s onward, flintlock rifles and shotguns remain in use amongst recreational shooters. Flint and steel used to strike sparks were superseded by ferrocerium (sometimes referred to as "flint", although not true flint, "mischmetal", "hot spark", "metal match", or "fire steel"). This man-made material, when scraped with any hard, sharp edge, produces sparks that are much hotter than obtained with natural flint and steel, allowing use of a wider range of tinders. Because it can produce sparks when wet and can start fires when used correctly, ferrocerium is commonly included in survival kits. Ferrocerium is used in many cigarette lighters, where it is referred to as "flint". Flint, knapped or unknapped, has been used from antiquity (for example at the Late Roman fort of Burgh Castle in Norfolk) up to the present day as a material for building stone walls, using lime mortar, and often combined with other available stone or brick rubble. It was most common in parts of southern England, where no good building stone was available locally, and brick-making not widespread until the later Middle Ages. It is especially associated with East Anglia, but also used in chalky areas stretching through Hampshire, Sussex, Surrey and Kent to Somerset. Flint was used in the construction of many churches, houses, and other buildings, for example the large stronghold of Framlingham Castle. Many different decorative effects have been achieved by using different types of knapping or arrangement and combinations with stone (flushwork), especially in the 15th and early 16th centuries. A flint church – the Parish Church of Saint Thomas, in Cricket Saint Thomas, Somerset, England. The height of the very neatly knapped flints varies between 3 and 5 inches (7.6 and 12.7 cm). Flint pebbles are used as the media in ball mills to grind glazes and other raw materials for the ceramics industry. The pebbles are hand-selected based on colour; those having a tint of red, indicating high iron content, are discarded. The remaining blue-grey stones have a low content of chromophoric oxides and so are less deleterious to the colour of the ceramic composition after firing. Until recently flint was also an important raw material in clay-based ceramic bodies produced in the UK. In preparation for use flint pebbles, frequently sourced from the coasts of South-East England or Western France, were calcined to around 1,000 °C. This heat process both removed organic impurities and induced certain physical reactions, including converting some of the silica to cristobalite. After calcination the flint pebbles were milled to a fine particle size. However, the use of flint has now been superseded by quartz. Because of the historical use of flint, the word "flint" is used by some potters, especially in the US, to refer to siliceous materials that are not flint. Flint bracelets were known in Ancient Egypt, and several examples have been found. Striped flint is today in use as a gemstone as well. While flint may be used in fire-lighting, it can become dangerous when exposed to excessive heat, as from a fire. Due to uneven expansion, flint may fracture, sometimes violently, during heating. This tendency to fracture is enhanced by the fact that most samples of flint contain impurities that may expand to a greater or lesser degree than the surrounding stone. This tendency to fracture is similar, but not identical, to the tendency of glass to shatter when exposed to heat. To combat fragmentation, flint/chert may be heat-treated, being slowly brought up to a temperature of 150 to 260 °C (300 to 500 °F) for 24 hours, then slowly cooled to room temperature. This makes the material more homogeneous and thus more "knappable" and produces tools with a cleaner, sharper cutting edge. ^ McPherson, Alan. State Geosymbols: Geological Symbols of the 50 United States. Retrieved 28 March 2019. ^ "Fire from Steel – Custom forged fire steels from Roman through Fur Trade time periods". Angelfire.com. Retrieved 2013-07-21. ^ Bush, Darren. "Traditional Firestarting Part I: How to Make Fire with Flint and Steel". Manly Skills, Self-Reliance, Survival. Art of Manliness. Retrieved 27 July 2015. ^ "Do you have 5 Ways to Make Fire?". Survival Cache. Retrieved 27 July 2015. ^ "Thoroughly Modern Milling" J.D. Sawyer. American Ceramic Society Bulletin 86, No.6. 2007. ^ "Ceramics: Physical And Chemical Fundamentals" H. Salmang & M. Francis. Butterworths. 1961. ^ "Notes on the Manufacturer of Earthenware" E.A.Sandeman. The Technical Press Ltd. 1921 . ^ "Changes & Developments of Non-plastic Raw Materials", Sugden, A. International Ceramics Issue 2, 2001. ^ "Whitewares: Production, Testing And Quality Control." W.Ryan & C.Radford. Pergamon Press. 1987. ^ "Use Of Flint In Ceramics, Industrial Ceramics No.885, 1993. ^ "Calcination Of Flint. Part 2: Continuous Process In A Vertical-Shaft Kiln." M. Manackerman & E.Davies. Research Paper 191. British Ceramic Research Association, 1952. ^ "Changes & Developments of Non-plastic Raw Materials", A.Sugden. International Ceramics Issue 2, 2001. ^ Ceramic Glazes. 3rd edition. Parmelee C. W. The Maple Press Company. 1973; Dictionary of Ceramics. 3rd edition. A.Dodd. The Institute of Materials. 1994; The Potter's Dictionary of Materials and Techniques, F.Hamer and J.Hamer, London, A & C Black, 2004. ^ Flint And Silica. C.M. Marsh. Proceedings of the American Ceramic Society Annual Meeting 1978; Materials, Equipment & Whitewares Division. 1978. ^ "Stoneware Clay Body Formulas. Part 2: The Perfect Body." J. Zamek. Ceramics Industry 155, No. 10. 2005. ^ Graves-Brown, Carolyn. "AB29 Flint bracelet". Swansea University. Archived from the original on 29 October 2012. Retrieved 13 January 2011. ^ "Building a cooking fire". Scout Notebook. 2001. Archived from the original on May 25, 2009. Retrieved January 30, 2018. Wikimedia Commons has media related to Flint. Look up flint in Wiktionary, the free dictionary.